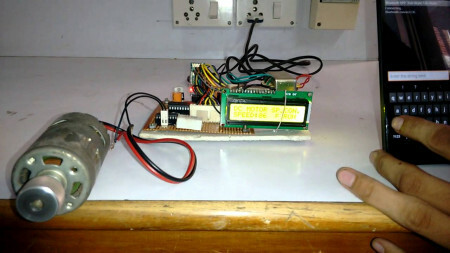 Motor Speed control and Temperature sensing unit using PIC Controller. This Article aims to design and implementation of DC motor speed, temperature sensing of material. 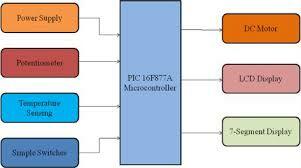 This project is mainly concerned on DC motor speed control system by using microcontroller PIC 16F877A. Motor speed can be control with variable resistor. So, this programming device can be used any motor to control their speed. Temperature sensing device display the temperature of any place. At the heart of the circuit is the LM35 and microcontroller which controls all its functions. LM35 is a precision temperature sensor with its output proportional to the temperature (in ºC). A temperature sensor LM35 is used for sensing the temperature of the environment and the system displays the temperature on an LCD. In this paper, microcontroller PIC 16F877A can control motor speed at desired speed with variable resistor and temperature sensing unit display the temperature of its take place. PIC is useful for electronic engineering department. It can be used such motor testing, temperature sensing for electronics devices. Direct current (DC) motors have variable characteristics and are used extensively in variable-speed drives. DC motor can provide a high starting torque and it is also possible to obtain speed control over wide range. DC motor plays a significant role in modern industrial. These are several types of applications where the load on the DC motor varies over a speed range. These applications may demand highspeed control accuracy and good dynamic responses. In home appliances, washers, dryers and compressors are good examples. In automotive, fuel pump control, electronic steering control, engine control and electric vehicle control are good examples of these. In aerospace, there are a number of applications, like centrifuges,pumps, robotic arm controls, gyroscope controls and so on. Temperature is one of the main parameter to control in most of the manufacturing industries like chemical, food processing, pharmaceutical etc. In these kinds of industries some product need the required temperature to be maintained at highest priority the product will fail. So the temperature controller is most widely used in almost all the industries. It is basically a close loop control system. 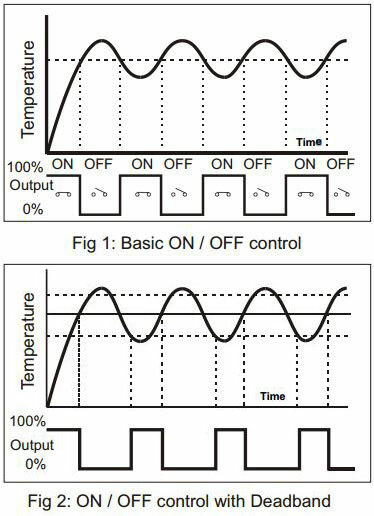 There are two types: ON-OFF type or continuous type system. ONOFF type- Temperature is sensed displayed and it is compared with set value. The following figure was adopted to develop the system. For precise speed control of servo system, closed-loop control is normally used. Basically, the block diagram and the flow chart of the speed control are shown in Figure 2 and Figure 3 respectively. The speed, which is sensed by analog sensing devices (e.g., tachometer), is compared with the reference speed to generate the error signal and to vary the armature voltage of the motor. The output pin of LM35 temperature sensor was connected to one of the ADC input pin of ATmega32 microcontroller. LCD was connected to Port C of the microcontroller. ADC was activated for interfacing the temperature sensor and a program wais written so that whatever temperature the sensor senses it can be displayed on LCD screen. A normally closed relay was interfaced to Port B of the ATmega32 with the help of transistor to turn off the heater when temperature is above the set point. Transistor was acting as a switch to turn ON/OFF the relay. An AC bulb was interfaced with the microcontroller with the help of relay. Reset switches were connected to PORT D so that user can set the temperature of the device accordingly. 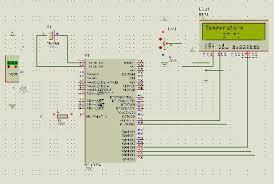 Finally, code was written such that the microcontroller can switch ON/OFF bulb with respect to set temperature. The speed of DC motor is directly proportional to the supply voltage. Pulse duration is directly proportional to the value of input voltage. When the value of voltage is slow, pulse will generate narrow and the value of voltage is high, pulse will generate wide. PWM controls adjusts the duty ratio of the DC motor. 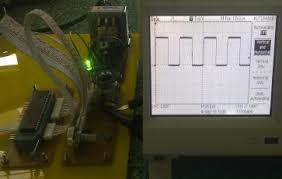 DC voltage is converted to a square-wave signal. When the voltage of motor decrease, the speed must decrease. When the voltage of motor increase, the speed must increase. The average DC value of the signal can be varied by varying the duty cycle. The following figures are shown for temperature sensing unit with practical results. LM35 is a precision temperature sensor with its output proportional to the temperature (in ºC). Processed to display the corresponding temperature value on the LCD. The output voltage varies by 10 mV in response to every ºC rise/fall in temperature; i.e. its scale factor is 0.01V/ ºC. If temperature sensor read 25 ºC , output voltage is 250 mV. If temperature sensor read 27 ºC, output voltage is 270 mV. Recent developments in science and technology provide a wide range scope of applications of high performance DC motor drives in area such as rolling mills, chemical process, electric trains, robotic manipulators and the home electric appliances require speed controllers to perform tasks. DC motors have speed control capabilities, which means that speed, torque and even direction of rotation can be changed at anytime to meet new condition. 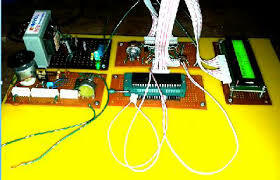 The goal of this project is to design a DC motor speed control system by using microcontroller PIC16F877A. It is a closed-loop real time control system. The controller will maintain the speed at desired speed when there is a variation of load. By varying the PWM signal from microcontroller to the motor driver, motor speed can be controlled back to desired value easily. The actual temperature and set value of temperature were getting displayed on the LCD screen. Output was verified by setting the temperature at different places and it was found at room temperature and weather temperature.